Philip Morris (PM) has instituted a Loyalty Fund Program (LFP), in conjunction with their Scan Data program. StoreTender supports the automatic application of the LFP discount on qualified transactions and records the LFP on the Philip Morris Scan Data reports. In order to participate in this program through StoreTender, you must have the PM Scan Data addon module. There are 4 different LFP Offers available to participating merchants. StoreTender supports offers 1 and 3 (immediate discount on purchase). Offers 2 and 4 (future discounts) are not supported. LFP SKU Code (field 14). Example: "LFPM4"
LFP UPC Code (field 15). Example: "028200197214"
LPF Offer Name (field 16). 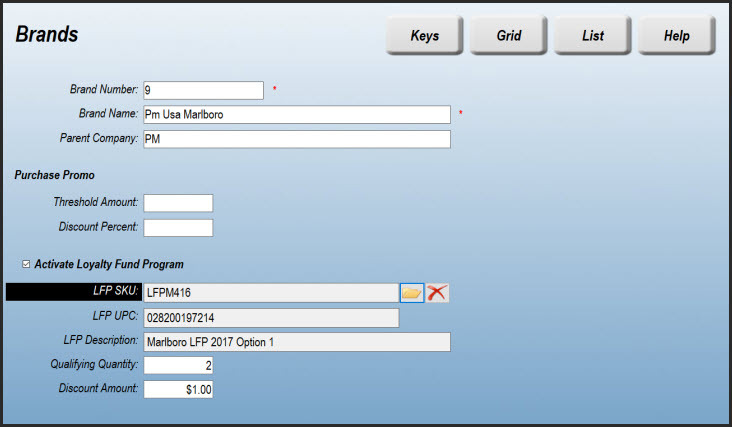 Example: "Marlboro LFP 2017 Option 1"
Once you have received the above information from your PM USA representative, follow the steps below to configure the Loyalty Fund Program. On the Brands screen (Data > Inventory > Brands) create a new Brand for your Loyalty Fund Program offer. Since the LFP is specific to Marlboro Mainline cigaretes, we suggest naming the Brand "PM USA Marlboro", with the Parent Company set to "PM". Save this record. You will be returning to edit this record after you complete the next step. Navigate to the Products screen (Data > Inventory > Products) to create a new Product for your Loyalty Fund Program offer. Enter the LFP UPC Code provided to you by PM USA into the PLU/UPC Number field. In the Full Description field enter the LPF Offer Name provided to you by PM USA. So that your receipts are neat and clear, enter "Loyalty Discount" in the POS Description field. Select and apply the "Tobacco" Department. You can also select the "Cigarette" subdepartment if you wish. This Department/Subdepartment's sales will be decreased by the amount of the discounts you provide. If you want to track these discounts in a separate Department you are free to do so. Select the Brand you just created in Step 1. If you wish the Loyalty Discount to reduce the sales tax owed by the customer, enter a Sales Tax in the appropriate tax box (Tax 1, 2 or 3). To have the loyalty discount not affect taxes due, leave black as in the example below. Finally, set your Vendor Item Number to the LFP SKU Code provided to you by PM USA. Save your new Product. The LFP information used in the below image is for exemplar purposes only. Before going live be sure to get the correct Offer name & numbers from your PM USA representative. Navigate back to Brands (Data > Inventory > Brands). Find and Edit the Brand you created during Step 1. Check the "Activate Loyalty Fund Program" checkbox, to view your setup options. 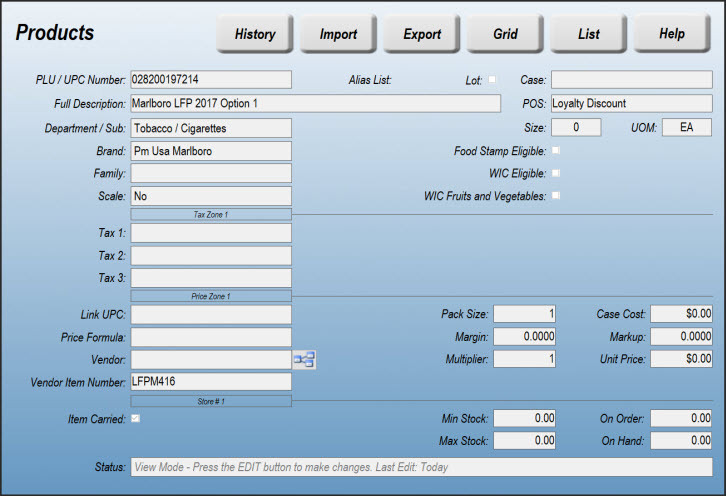 Click the folder icon to the right of the LFP SKU field, and select the product you created in Step 2. The SKU, UPC and Description fields will fill automatically. Enter the Qualifying Quantity for your Offer. Typically Offer 1 requires 2 packs, and Offer 3 requires 3 packs. Enter the Discount Amount for the Offer. Save the record when finished. To qualify for the LFP, your customers (Adult Smokers) must make a purchase of at least 2 or 3 revenue packs of Marlboro Mainline cigarettes in a single purchase transaction. You will need to assign the Loyalty Brand you created above to those qualifying cigarettes. To do so, navigate to Products (Data > Inventory > Products) and find each PLU that would qualify. Edit and save that record, selecting the new Loyalty Brand. You can also use the Grid function to more quickly edit these records. Now that your Brands and Products are properly configured, you need to Press SYNC (or the Update Register POS function) on each POS computer to accept the above changes. You're now ready to use your LFP Offers. To provide the LFP Offer discount you must attach a customer record to the sale. This can be done at any point during the transaction* by either scanning the customer's loyalty card or by selecting [Find] > [Acct]. * Note: In the event that the Product has both a multi-pack discount and Loyalty discount, the customer account must not be set to Tier Pricing discounts. If they are, then assigning the customer before ringing in the products will not allow the multi-pack discount to apply. You must add the customer at the end of the transaction. Once the Qualifying Quantity is sold, the Discount Amount will be awarded. The LFP can only be awarded once per transaction, regardless of the quantity purchased above the Qualifying Quantity. Additionally, StoreTender has logic that will award the discount on a qualifying transaction if a full Carton is sold. Your LFP has a pre-determined lifecycle. When you are ready to discontinue use of the LFP Offer, simply DELETE the LFP details from the Loyalty Brand you created, by Finding and Editing the Loyalty Brand. To the right of the LFP SKU field, click the red "X" to delete the information. Save your changes and SYNC your POS computers to accept. There's no reason to delete the actual Loyalty Brand item, nor should you need to update your Marlboro Mainline Brand settings (after the initial setup). To add a new LFP Offer, follow Steps 2 and 3 above. You won't need to create a new Loyalty Brand, but you will need to edit it, attaching the new Product.